On the night after Christmas, Tim and I had a rare opportunity to go on a date night with my sister and her husband. A movie was on the docket after our dinner at Eat Chow and three contenders were up: American Hustle, The Secret Life of Walter Mitty and Inside Llewyn Davis. The Coen brothers won, but ultimately, we lost: $20 and two hours of precious time. I would offer a spoiler alert, but there is nothing to spoil. Nothing happens. Let me rephrase that. Nothing happens that we care about. Sure, Llewyn has a life. It’s just not a life you’d pay to watch. I’d pay to listen to him on stage. The music is phenomenal, but the character and the film is crap. He gets women pregnant, pays for abortions, sleeps on couches, drinks too much, takes advantage of friends and then blows up at them. He is smug and scornful of everyone surrounding him. None of those things necessarily preclude him from being a character I root for. The problem is that he doesn’t learn from any of it. He deliberately misses opportunities to do the right thing, or make a decent choice. Even when he tries to do right, it usually turns out all wrong. Basically he’s a prick, who doesn’t have the ability, or desire to be anything different. We all know guys like that, but we certainly don’t pay to watch them in action. 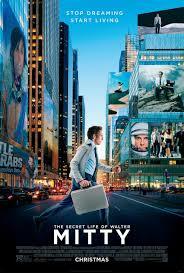 Tim and I needed to cleanse our palate, so we snuck away on Saturday morning and saw The Secret Life of Walter Mitty. This time, we were thrilled, perhaps overcompensating a bit for the debacle of Llewyn’s life. Walter is a man with a small life, trading it in for big daydreams. He “zones out,” content to imagine whom he might be. But when life amps up its inevitable challenges and Llewyn is content to stew in his inadequacies, Walter finally is not. He will step outside of himself, get on a plane, stand up to the bully, speak to the girl. Standard Hollywood fare perhaps, but well-done, beautifully shot, clever and compared to the Coens’ work, a relief. Don’t get me wrong. I love art house films. I don’t need happy endings, or easy answers. Not every death needs to be followed by a resurrection, but offering viewers some way to connect, or empathize with the protagonist or villain is almost a requisite for a film to be worth watching (in my mind) and the Coen brothers didn’t provide it this time around. Ironically, we chose the Coens’ film because of the critical reviews. Raves all around, but as I walked out of the theater, all I could think was that the emperor had no clothes. 93% of critics on Rotten Tomatoes told audiences to go, but I can’t believe 93% of the critics who watched this film and thought it was worth watching. I imagine at least half of them walked out as dumbstruck and disappointed as we were, but were also too afraid to admit it. So be it. 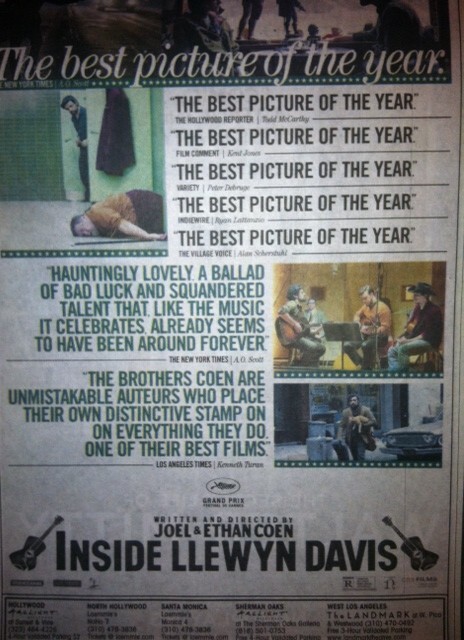 At the risk of coming across as naïve and uncultured, don’t go see Inside Llewyn Davis. Save yourself some time and money; if you like folk music, buy the soundtrack instead. Posted in Movies and tagged as brothers, Coen, critics, Davis, emperor, Inside, life, Llewyn, Mitty, movie, no clothes, Review, Secret, Walter. Thanks for the insight, I often do not agre with the critics. Other movies we went out to see and enjoyed were The Book Thief, Saving Mr. Banks, Captain Phillips. This is the time of year we are rushing to view all the movies before Oscar night! Oh yes and Philomena was great!!! Speaking of movies – Ray and I were very moved by Philomena which is playing at Hollcrest. Andrew and I opted for American Hustle and loved it. It is not really a comedy, tho it has many really funny moments. The thing we liked best about it is that it doesn’t take itself at all seriously. And the actors were all terrific. I still hope to see Philomena in theaters too. Let me know if you enjoyed it! Sister – I actually read a review saying it was empty, void of anything worth watching. So, you are not alone, and I have no desire to see it or “The Wolf of Wall Street”. I also don’t need everything to end well, but I refuse to spend my money (and more importantly, time) watching people act like dicks without repentance. Good Lord … I experienced enough of that in my household growing up. I am so glad to hear that there was a “voice crying out in the wilderness,” speaking the truth as I saw it about that film. In most of the reviews I read that had it as one of the best films of the year, no one actually had anything good to say about it’s entertainment, or as pleasurable experience. I would read the review and wonder why it was on the list. Thanks for responding. I hope you watched something worth watching this season!